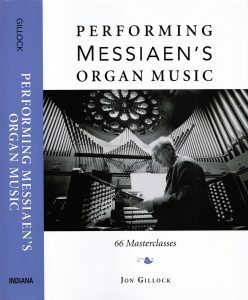 Jon Gillock’s book, Performing Messiaen’s Organ Music: 66 Masterclasses, was released by Indiana University Press in early 2010. It is available directly from the publisher (iupress.indiana.edu) and at amazon.com. ISBN 978-0-253-35373-3, xxi plus 428 pages. The main part of the book contains Gillock”s own artistic consideration for the interpretation of these works, based on 35 years of performing and teaching them, in masterclasses. Here, he leads the reader through all the organ works in detail drawing on musical structure found in the scores, religious and musical symbolism, and intuitive insights to illustrate his points. The book also contains translations of all biblical quotation cited as subtitles and Messiaen’s own published notes for these pieces, background information about each piece, detailed information about the organ at La Trinité in Paris for which most of the works were conceived), a glossary of terms unique to Messiaen’s musical language, and a biographical sketch of Messiaen.